I am in CHRISTMAS mode this month, in a BIG way! 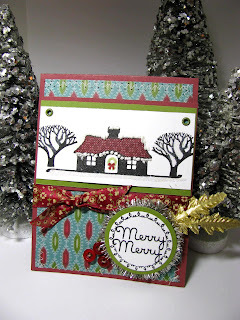 Another Christmas sample using Pink Persimmon's little Christmas cottage set! 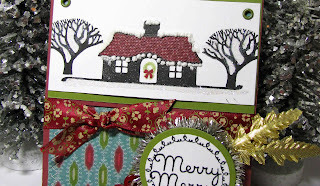 I paper-pieced the cottage's little roof, then used liquid applique for snow on top and hanging down as icicles. I got this tinsel-like ribbon at Michaels' on clearance last year, and used it as a glittery accent behind my sentiment. I also found that cool red ribbon at Michael's in the dollar section! I need more of it! Oh Lisa! This is DARLING! LOVE this image and the GORGEOUS papers and layout!!! Love this card! The papers are too cute! The little house image is perfect for the season. That is a cute little cottage on your very cute card. What about the paper, please.